CHICAGO, Illinois, September 8, 2010 (ENS) – Professional sports leagues across the country today moved as one in support of solar power and clean energy in arenas and stadiums to help curb climate change. Major League Baseball, the National Football League, the National Basketball Association, the National Hockey League, and Major League Soccer delivered a letter encouraging all their teams and facilities to begin using solar power. 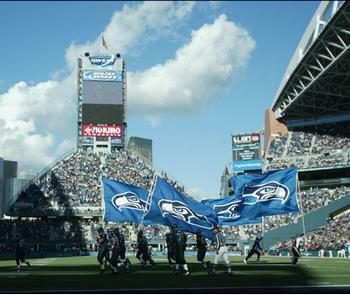 “You expect solar on the Staples Center, but maybe not in Seattle,” said Darryl Benge, assistant general manager of Qwest Field and Event Center, home to the Seattle Seahawks football team. “But despite our town’s reputation for rainy weather, we are excited to generate some of our own electricity and show that renewable energy can work everywhere,” Benge said. The leagues distributed a solar development guide produced on their behalf by advocacy groups the Natural Resources Defense Council, NRDC, and Bonneville Environmental Foundation, BEF. The guide outlines the work necessary for each stadium to add on-site solar power generation to its energy mix. “Utilizing solar energy is an important and efficient environmental action that sends a broader signal to the culture. It not only conveys a critical message to all sports fans, it improves the efficiency of our facilities and protects the environment,” Bettman said. The environmental groups say the leagues’ embrace of solar power sends a strong message to millions of fans and event-goers and it could have a big impact on the teams’ bottom lines too. In most American cities, solar panels can pay for themselves, potentially offsetting significant energy costs in the long-term. Los Angeles’ Staples Center, for example, currently meets five percent of the facility’s total energy needs with a solar power array. “The distribution of solar power development guides by all professional sports leagues reflects a real cultural shift in our thinking about energy that is taking place throughout the business community and the nation at large,” said NRDC senior scientist Allen Hershkowitz, PhD. The guide offers a step-by-step outline on how to begin moving forward with on-site solar panels. They include an overview of the advantages and challenges that come with various technologies, and ideas on locating panels and their dimensions, cost estimates. There are suggestions on financing the initial installation costs, as well location-specific estimates on time for the energy generated to payback initial costs and greenhouse gas savings for each pro team market. The guide uses Staples Center in Los Angeles as an example of how to integrate solar power into a sports facility. Staples Center serves as home to the L.A. Lakers and L.A. Clippers basketball teams, the L.A. Sparks women’s basketball team, the L.A. Kings ice hockey team, and the L.A. Avengers football team well as hosting special events and concerts. 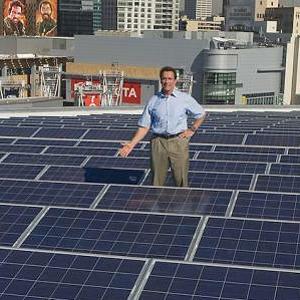 Staples Center currently has 1,727 solar panels installed on its rooftop. The 345.6 kilowatt system associated with the Staples Center will provide environmental offsets over the next 25 years, management of the center says. These benefits include the elimination of over 10,000 tons of the greenhouse gas carbon dioxide, over 33 tons of nitrous oxide, another of the principal greenhouse gases and more than 27 tons of sulfur dioxide. The net clean energy benefits of the system equates to the environmental benefits of 170 acres of mature trees, Staples Center management says. The guide also points to the newly installed solar array at the US Airways Center in Phoenix, Arizona. In 2009, the Phoenix Suns organization, the City of Phoenix and APS partnered to install solar panels on the fifth level of the US Airways Center parking garage. The 1,125 Suntech solar panels covering about 18,000 square feet are generating electricity to help offset the traditional energy usage of the arena. The new solar power system eliminates the generation of more than 440,000 pounds of carbon dioxide per year from the environment, an amount equal to the carbon dioxide emitted by 26 Suns home games, the arena management said.